Artistic skill requires a certain cost not only time but also mental and physical strength. 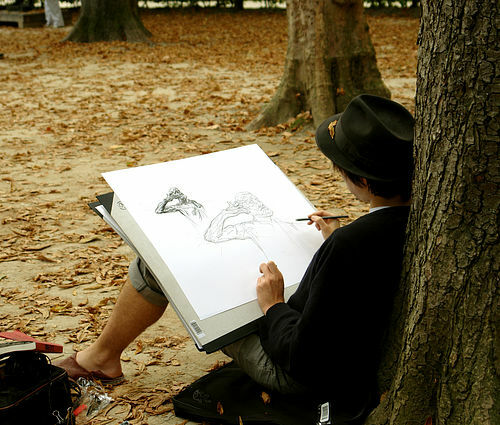 And if you decide to learn to draw, you must honestly ask yourself is, what do you mean by "draw". It's one thing when you should be familiar with the basics of visual literacy, to draw on the computer in different graphics editors. In this case, your skill level to a greater extent depends on the development and knowledge of graphical programs. You can start, for example, with photoshop. And quite another if you are a fan of classic approach to drawing and aiming not only to draw correctly, but to develop artistic thinking, and the ability to see the harmony of shapes, lines, shades, color, etc. ), to seize and to transfer the basic essence and nature of the object. For centuries optimal the transmission of any knowledge, occurred in conditions of the oral tradition, from teacher to student. Only relatively recently emerged written. Live contact with the master, it is a good example, is an important factor in the development of the secrets of the craftsmanship. But in this age of rapid development of means of communication, particularly the Internet a viable choice are video drawing lessons. This option is especially good if you have no opportunity to attend an art school or club. Whatever method of learning you choose, remember, simple repetition is achieved perfection. Draw often and much. Stick to the principle of sequence learning: from simple to complex, from the particular to the General. For example, drawing with a pencil is better to start with studying simple geometric shapes, learn to apply the shadow the same shape, changing the position of the light source (best to use a hatch), then move on to the layout of the forms. To learn to draw figures of people and animals, it is important to study the structure of the body, plastic, facial expressions, dynamics. Remember the constructive approach to the image. Watch the master, follow the sequence of his actions. Learn to make sketches to capture the essence of a few key strokes). Model the skills yourself. To learn how to paint, it is convenient to start with watercolors, but try other means (ink, gouache, sauce). Drawing still life or portrait, try from the start to make a sketch, catching and passing the main color and the tone of the picture. Then go to the General setting. To create landscapes that need to spend more time in nature, to contemplate, to explore, to push the limits of color perception. For those who want to learn to paint for pleasure and enjoyment by the process of creativity, the taste will be courses in art therapy. The main purpose of which is: unlocking your creative potential, develop the capacity of original thinking and expression, stress and tension, finding inspiration and inner harmony.